The photograph of you, spread by the media, shows a young man wearing a camouflage jacket, blue jeans and what is perhaps a wry grin. At your side is the body of a large gray and bloody wolf. He is Oregon 9, litter-mate to Oregon 7, or Journey, the renowned wolf who has traveled over 1,000 miles in search of a mate. I admit to a feeling of grief while viewing this picture. Drained of the vigor of life, the body of Oregon 9 is so diminished, a mere semblance of what he was before. When you shot him, he became nothing more than an object, a vacant-eyed prize. Did you expect to bring home a wolf when you pulled the trigger? You did not. You captured skin and bones, a pool of blood, but the best of him was gone. Besides grief, I feel anger. There was no need to shoot that wolf–we all know that. His meat will not feed your hungry children. His coat will not stave off a frigid wind. He was not shot in self-defense or to protect anyone or anything. Economically, his corpse won’t boost your bank account. Your decision to kill Oregon 9 came from something other than necessity and that, I am most curious about. What would you say if I asked why you shot the wolf? Or is trophy hunting so ingrained in you that you’ve never questioned it? Perhaps it’s a tradition you’ve been raised in, a sport revered by family, friends and neighbors. 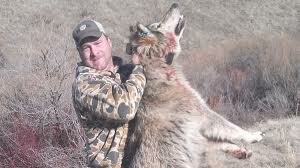 Maybe your relatives helped eradicate wolves from Idaho years ago. At least then, folks didn’t have the scientific evidence we have now to point out the ignorance of their acts. There’s a world of difference between you and I, but not so much as we might think. We’ve both been conditioned throughout our lives and yet we can both decide what to keep and what to throw out from these teachings. This is not only our right but our responsibility. As members of a sentient species, we should question paradigms, make changes, and consider how our choices affect the world we live in. It’s easy to judge what another’s life-lessons has turned him or her into, and I’m trying not to do this. You may be a kind and generous man; you may split wood for an elderly neighbor and read books to your children. But the bloody wolf at your side denotes an aspect of your character I find disconcerting, as well as outmoded. If this photo were a daguerreotype it would be easier to accept. In a world where humans are decimating the environment and driving extinction rates faster than species can evolve, Dane’s philosophy is one to be revered. Changing our own ways is more difficult than expecting others to change theirs, but selflessness such as his is the only hope we have in preserving the world that supports us. It would be presumptuous of me to ask you, the man who shot Oregon 9, to change. But I will ask you to think, to sincerely question your actions. And if I ever get the chance to ask why you shot that wolf, I’ll be interested to learn if you have arrived at an intelligent and ethical answer. I agree, it’s extremely frustrating to see how the political climate has affected the welfare of wolves. This battle is a cultural one in so many ways, and it shouldn’t be that way. Decisions should be based on science, not fallacy and fear. I do feel our persistence in protecting wolves will pay off, but we have a long road ahead of us.